First go to pipes.yahoo.com and Create a new Pipe. You’re going to have to log in. 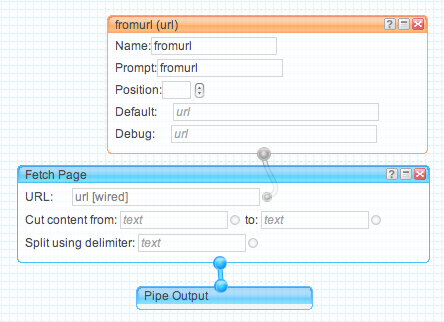 Drag “URL Input” from “User inputs” to your pipe diagram. Now get back to “Sources”. If you’re planning on fetching a website, drag “Fetch Page”. If it’s a JSON or XML feed “Fetch Data” (all data will be automatically transformed ). The next step is linking the elements together. Drag a link from the “URL Input” into you source’s URL Attribute and from sources output to Pipe Output. Click “Save” and “Run Pipe…”. You’ll be taken to the pipe information page, where you can enter the URL which you want to proxy. Submit with “Run Pipe”, after it has loaded, select “Get as JSON”. These examples used “Fetch Page” in pipes. Here’s an example of reading an RSS feed using “Fetch Data”. This script alerts the most recent news item from an external RSS feed. Notice that Yahoo Pipes conveniently transforms any feed to JSON (or XML if you really really want). Now go and cross site the hell out of the internetz! Soon slightly more practical examples.